As a result of listening to this audio, you can get a good night’s sleep and be energized for the day! Sleep apnea affects the way you breathe when you’re sleeping. In untreated sleep apnea breathing is briefly interrupted or becomes very shallow during sleep. These breathing pauses typically last between 10-and 20-seconds and can occur up to hundreds of times a night. This recording comes from Dr Jan’s clinical success with helping clients get a good night’s sleep and be energized for the day. The goal is that you will begin to overcome anxiety about Sleep Apnea and begin to look forward to having a good night’s sleep. 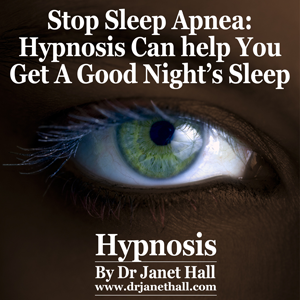 The sooner you begin regular listening to Dr Jan’s hypnotherapy recording, the sooner that will be reality for you. Listen to this recording over and over again. Listen every day, if you can, and certainly every night as you go to sleep and be patient. If you were unfit and just started going to the gym you wouldn’t expect to be fit after one visit.